First of all, I would like to take a moment and thank all of the families who attended and/or assisted with our Physical Festival on September 17th . The kids are still having fun even now practicing their dances and exercises that they learned in preparation for it. Ever since April, long before Physical Festival preparation began, the Senior class students had been wondering if they would get to do things like the yosakoi dance, too. They did a wonderful job when their turn came. 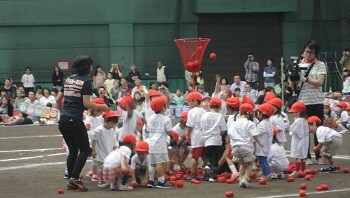 As a result, the Intermediate children watched and imitated them, while the Junior children had a chance to see how cool the Intermediate dance could be, in turn. The Senior classes always serve as something for the Intermediates to aspire to, and the same can be said of Juniors learning from Intermediates, too. While most activities take place within classes or grades, it is these times where the younger children are able to observe, and in doing so gain a desire to perform a dance or activity themselves . Going forward in October I am hoping to foster a good environment for this kind of interaction. The days have grown cooler and autumn is here. It is a season to build the stamina that gets us through the winter. The exercise equipment like mats, stilts, and iron bar have been refurbished here at IYK, and teachers even undertook exercise training from an instructor. These same instructors also helped us to conduct one of the Mother Support Days as well. These days there is a lot of talk concerning children’s physical fitness, whether it be walking long distances, catching themselves when they fall, or just having patience and waiting in line. But the reality is kids really love doing physical activities. For instance, when we visited the park many of them enjoyed simply running up and down the small hill that was there. Another example comes during dodgeball, where even children that are tagged out say “I want to play more!” The problem arises when the children haven’t developed their base motor skills. This leads to them getting tired or not being able to use a ball or other equipment properly. Some of these can even be trained at home, like holding hands and jumping together, balancing on one foot, or just hanging off of mom or dad’s arms. Also, children pick up on things like rules and taking turns by having a good example set for them by adults. Exercise doesn’t simply make us physically fit, but can also teach us life skills and learning to cope with wants and needs. It will be great to give the children a chance to move their bodies about a lot in the coming months!